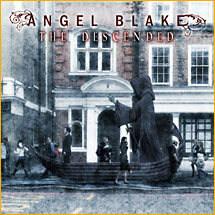 Review: "Angel Blake: The Descended" - Sea of Tranquility - The Web Destination for Progressive Music! Much different than his former band The Crown, guitarist Marko Tervonen's Angel Blake returns with its second album � this time on Finland's Dynamic Arts Records instead of Metal Blade. A new label, new members and a new edge seem to have Angel Blake poised for greater things. Most significant is the arrival of vocalist Tobias Jansson, who looks like country-music rebel Travis Tritt but injects The Descended with Tobias Sammet-like attitude and gives Angel Blake more of a "band" feel than 2006's self-titled debut (which initially started out as a Tervonen solo project). While certainly veering away from The Crown's brand of death metal, the music of Angel Blake isn't as gothic as The Descended's title and artwork might indicate. Granted, there is the occasional grunt, and Tervonen's guitar is just as razor-sharp as it was in the The Crown, but this material boasts much stronger melodies, more melancholy and greater mainstream metal appeal. About half of these 10 songs are keepers, with the other half proving Angel Blake needs a little more work. Essentially, The Descended reveals a band in the middle of its own ascension. Guitarist Marko Tervonen steps away from his death metal background to take a stroll down a more mainstream heavy metal path with his new group Angel Blake. Although this is the second album by the band, there is something completely different about this disc and the addition of new lead singer Tobias Jansson seems to be the missing piece in the puzzle. Using a much more melodic approach on The Descended, these guys have made an album that is a very good representation of heavy metal the way it should be played. Tobias' deep resonant voice is ideally suited for this type of music and Tervonen keeps things very entertaining with some superior guitar work throughout the disc. From the thrashing opening number "Anywhere But Here" to the atmospheric ending "You'll Never Need To Feel Again", the band gives you some great quality metal. While not ever song on the disc is a barn burner, there is enough on the CD to keep me listening. It also makes me think that this band has a terrific future if this is any indication of things to come! It might not be the album of the year but I would not be surprised to hear a tune or two turn up with regular air play, especially my favorite the absolutely dynamite "Defenseless". It is a piece of melodic metal that is as they say radio ready. There is a lot of talent in this band, that is obvious. I just hope they don't settle for making GOOD songs when as they show here, they are capable of great ones.